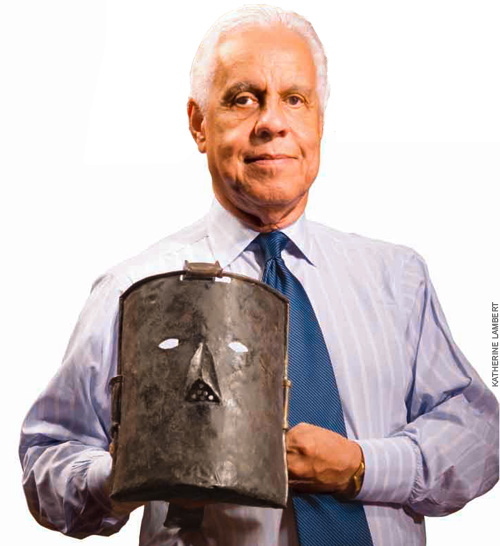 It is Black History Month.Unfortunately, some of that history may very well be lost as the result of actions by a grandson of slaves, former governor Doug Wilder. If you haven’t kept up with what’s been happening with the proposed slave museum, this Washington Post article, reprinted in today’s Virginian-Pilot, gives a lot of the background. Not only is the museum in bankruptcy, but Wilder has stopped talking to people about it, including not talking to those who donated artifacts. What has happened to those artifacts is the thing that bothers me the most. So much of black history has been lost over the years, because much of it relied on oral history. I still remember watching “Roots” as a kid and being amazed that a family had passed the story of Kunta Kinte through its generations. While I know I am the descendent of slaves on both sides of my family, my ability trace my own roots is limited by the lack of records. To be able to see the artifacts, such as the mask that Wilder is holding in the photo above (see the slideshow here), is to see a history that wasn’t written down, that was, in many ways, whitewashed. As I said in an earlier post, history is written by the victors. I have no idea whether they have the space for it but the perfect place for all of the artifacts would be Fort Monroe, as mentioned in this 2011 editorial. Whatever is decided, the sooner it is, the better. For all of us. What a sorry situation! As a white transplant to South Carolina, I can see the need and worth of collecting these artifacts of a time that many would like to forget. How do we expect young people to value history when powerful adults show such disrespect, not to mention lack of accountability? This project has seemed doomed almost from its conception. Almost. At the beginning, there were some big names involved, like Bill Cosby. But it quickly became a one-man show. These alleged actions, tell you a lot about a person of integrity, pride and respect and their love for their fellow brothers and sisters. I have been researching my ancestry from the State of Virginia and have come across a lot of negative individuals who wish to suppress history, but to have another Black person to hinder this knowledge and history is unacceptable. This supposed behavior demonstrates what has always been said “it is always another Black person that will destroy their own”. Mr. Wilder, if you read this blog, please – you know what is the right thing to do, show goodwill and do the right thing – and move on without animosity, bitterness and discord.